The Latin name for the bay tree is Lauraceae Nobilis. Laurus means praise and Nobilis, renowned. Bay leaves, which are also known as laurel leaves, have a long and noble history. The ancient Romans and Greeks used to make crowns out of bay leaves for great and accomplished people. This is why Greek and Roman scholars are usually portrayed wearing the traditional head wreath made of laurel leaves and that’s where we get the modern day expression ‘resting on your laurels’. The Indian bay leaves are believed to have first been cultivated in the Himalayas. They are from the same botanical family as the bay leaves found in the West but have a rounder shape and a taste similar to cinnamon or cloves. Bay leaves can be grown as a culinary herb at home but true bay laurel requires a climate similar to their natural Mediterranean habitat. It prefers rich, well-drained soil and sunny weather. The bay leaf tree is evergreen and grows up to a height of 12m. The growth rate is very slow but once it starts growing it requires room to spread out. 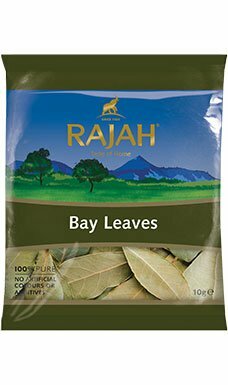 The bay leaves are usually harvested once the plant is a couple of years old. The leaves should be dried before use, as fresh bay leaves are bitter. The best wait time is around 48 to 72 hours from the time the leaves are picked. Bay leaf is ideal for seasoning stews and soups. It is used in both mild and strongly seasoned dishes and works well with many other herbs and spices. In many homes, a few bay leaves are placed in cabinets where flour and other grains are kept in order to repel bugs. Though bay leaves are used the same way as dried herbs and spices, they shouldn’t be stored in the spice drawer or masaldan. Instead they should be placed in the freezer as they retain almost as much flavour and aroma as a freshly opened jar or packet of bay leaves. Bay leaves stored in masaledanis (spice box), however, quickly lose its potency. The oil extracted from bay leaves, called bay leaf oil, has medicinal properties and is used to treat several ailments. It is known for its anti-bacterial, anti-fungal, anti-inflammatory, diuretic, and astringent qualities. It is also used as a pungent addition to potpourri and an ointment made from the bay leaf can help reduce joint inflammation.